Militants activity in Burkina Faso have been on the rise for the past two years. Since June 2018 Sahel MeMo observed similar trend with an expansion from Northern parts bordering Mali and Niger, to the Est Region on the borders with Benin, Niger, and Togo. Militant groups have been trying to establish a base there since early 2016, explaining groups’ ability to carry complex deadly attacks, including the use of improvised explosive devices (IEDs). Violence in the eastern part of Burkina Faso by militant groups most likely to continue. In addition to targeting security forces and intimidation acts against civil servants, militants will look to continue to disrupt gold mining in the area. In fact, security forces in charge of protecting gold mines or escorting staff have been subject to attacks by militants at least in August 2018. If this to continue, livelihoods of local communities benefiting from gold mining could be at risk if security situation continues to deteriorate in the region. These attacks are mostly attributed rather than claimed by militant groups known to operate in Burkina Faso. These militant groups include Ansaroul Islam, Jama’at Nusrat al-Islam wal-Muslimeen (JNIM), and Islamic State in the Greater Sahara (ISGS). 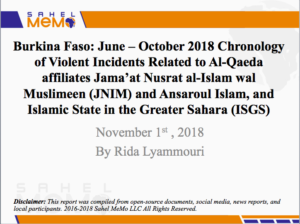 Out of the three only JNIM have been consistent releasing official claims of attacks. 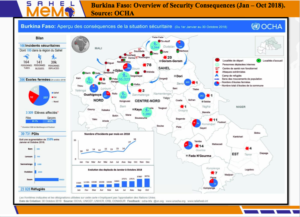 Thus analysts, observers, journalists, and Burkinabe authorities are contributing most of violent incidents based on the area where occurred and means used. 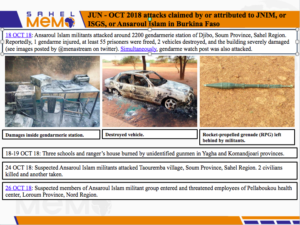 Important to note that between June and October 2018 no incidents officially claimed by JNIM. This could be explained by difficulty of movement during rainy season (June – October) in the region. October 3rd witnessed the first reported French airstrikes against militants after request of support from Burkinabe authorities. This was following a deadly attack against Inata gold mine gendarmerie post.